Editor’s Note: Leonard Berlin, MD, FACR, is a professor of radiology at Rush University Medical College and chairman of the department of radiology at Rush North Shore Medical Center in Skokie, Ill. He began his writing on risk management and malpractice issues in a series of articles in the American Journal of Roentgenology. Those articles became the basis for his well-known book Malpractice Issues in Radiology. This column is drawn from that book. The third edition of Malpractice Issues in Radiology will be available from the American Roentgen Ray Society at RSNA 2008. John J. Smith, MD, JD, is a partner at Hogan & Hartson LLP in Washington, D.C. He specializes in legal and regulatory issues related to medical devices. A 63-year-old man who had been complaining for 2 weeks of “aching” in his lower abdomen was referred by his family physician to the radiology department of a hospital for CT of the abdomen and pelvis. Two days after the CT examination, the physician telephoned a secretary in the radiology department, stating that he had not received a report of the CT findings. The secretary replied that she would investigate the matter and forward a report to him. Four days later, a nurse at the physician’s office again telephoned the radiology department to complain that a report of the CT examination still had not been received. There is no evidence that anyone in the radiology department followed up on these telephone calls. Eight days after the CT examination, the patient experienced acute onset of excruciating pain in the lower abdomen and back. The patient was rushed to the emergency department of the hospital, where he was found to be profoundly hypotensive and tachycardic. Sonography was ordered and disclosed a 7-cm-diameter dissecting aneurysm of the abdominal aorta. The patient underwent emergency surgery, which revealed a ruptured abdominal aortic aneurysm. Surgical repair was attempted, but the patient died on the operating room table. Nine months later, the wife of the deceased patient filed a medical malpractice lawsuit against the hospital, the family physician, and the radiology department’s chair and head of the CT section. The lawsuit alleged that the patient’s death was the result of needless delay in the diagnosis and treatment of the abdominal aortic aneurysm; it specifically charged the radiologists with “gross negligence” in failing to provide in a timely manner a report of the CT examination. The lawsuit sought $250,000 in compensatory damages and $500,000 in punitive damages. All of the codefendants notified their professional liability insurance carriers of the lawsuit, and the carriers quickly appointed legal counsel for each. The defense attorneys, along with the hospital’s risk manager, undertook a thorough investigation of the incident. It soon became apparent that the major problem in the case centered on the radiology department. Three months before the patient’s death, the hospital’s radiology department had completed installation of a new PACS and radiology information system. The radiology information system tracked all procedures from initial request through examination completion, and archived radiologists’ reports. The radiographic images for all modalities except mammography were interpreted and then stored on the separate PACS. Hard copies were printed only for surgical cases or on special request. Investigation confirmed that there had been a CT requisition for the patient. The CT examination was listed as “complete” in the radiology information system, indicating that the study had been physically completed and transmitted from the CT scanner to the PACS for interpretation. However, neither the radiologist’s report of the study nor any of the CT images presumably archived in the PACS could be found. A review of the hard-copy log for the CT scanner on which the abdominal and pelvic CT had been obtained disclosed no entry for the patient. Furthermore, storage disks for the day on which the examination had presumably taken place did not contain data under the patient’s name or identification number. Perplexed, the attorneys representing the hospital and the radiologists retained a PACS expert to further explore the processes by which CT images were obtained and sent to the PACS. The expert learned that when a patient arrived for his or her examination, a technologist used a request form generated by the radiology information system to manually enter patient data into the CT scanner. After the CT examination was finished, the technologist placed an “examination completed” entry into the information system. Image data, identified by the technologist-entered patient information, was then sent manually to the PACS. Data from the information system was used to generate a printed uninterpreted-cases list that was provided every morning to the attending radiologist assigned to the CT service for the day. The list covered the previous 7 days, but newly acquired cases were intermingled with older uninterpreted cases in the PACS. The PACS expert noted that there was no automated cross-comparison between the information system’s uninterpreted-cases list and the new cases that appeared in the PACS workstations. Quality control fell to the covering radiologist, who was expected to check the uninterpreted-cases list against new images that appeared in the PACS system and take appropriate action if a study on the printed list did not appear in the PACS. Given the volume and pace of the service and the changing nature of the uninterpreted-cases list as additional examinations were obtained during the day, it was possible for a radiologist to overlook an uninterpreted case that was not on the PACS. Compounding the problem was the CT section’s rotation system, which had different attending radiologists covering CT from day to day, and the lack of a designated individual to address uninterpreted cases. Uninterpreted cases became particularly problematic if they remained uninterpreted for more than 1 week, because they were deleted from the uninterpreted list and no formal mechanism existed to identify them. With his investigation complete, the PACS expert surmised that the lost examination had not been successfully transmitted to the PACS and had gone unnoticed on the uninterpreted-cases list generated by the information system. Furthermore, the expert suspected that the examination itself probably contained incorrectly entered information, perhaps an incorrect patient name or identification number. At this point, the radiology department chair instituted an exhaustive review of the CT scanner storage disks for the dates close to the day on which the patient’s original CT had been obtained. This comprehensive manual search of more than 200 CT scans eventually discovered the lost examination, filed under an incorrect name and identification number. A retrospective review of the images revealed a 6-cm abdominal aortic aneurysm with signs of early dissection. The attorney representing the hospital advised her client that the loss of the CT examination was clearly the responsibility of radiology department personnel, and that there would be little chance that the hospital, as employer, would escape liability. The position of the two radiology defendants was somewhat different. The radiologists thought that they had no responsibility in the matter, inasmuch as they were not presented with the CT examination before the patient’s death, and thus had no opportunity to interpret it. The radiologists also maintained that because the loss of the CT images apparently resulted from an error made by radiology department personnel, liability for the error should be borne by the hospital that employed these personnel, not by the radiologists, who lacked authority over them. However, the radiologists’ defense attorney pointed out that it was quite possible that the court might hold the radiologists vicariously liable for radiology department personnel if it could be demonstrated that the personnel were acting under the direct supervision of the radiologists. Because the attorney for the plaintiff had already retained a cardiovascular surgery expert who was prepared to testify that the fatal rupture of the patient’s aortic aneurysm would have been prevented had an elective surgical repair been performed 1 week earlier, the defense attorneys for the hospital and radiologists strongly advised a settlement. After much negotiation, the lawsuit against the hospital and radiology defendants was settled for $250,000. One month later the family physician, who had been accused of negligence for failing to promptly obtain the CT report and refer the patient to a cardiovascular surgeon for elective surgical repair of the aneurysm, settled for an additional $250,000. PACS technologies are relatively new tools. The law frequently lags behind the development of technology related to the production, storage, and transmission of radiologic images. Although federal and some state lawmakers have begun to regulate computerized and electronically stored records1, no case law is known to us that directly addresses instances in which electronically acquired and stored images have been lost or have failed to be interpreted in a timely manner. Nonetheless, analysis of cases that deal with issues similar to those presented in this article can provide valuable insight as to how courts would likely proceed when faced with lost cases involving PACS. Two major questions must be addressed in a lost PACS case: Does a doctor-patient relationship exist between a patient and a radiologist when radiologic images are never seen by the radiologist? And, can radiologists be found negligent and held liable if radiologic images not under their direct control are lost? Let us examine these two issues more closely. That radiologists create a legally valid doctor-patient relationship with patients whose radiologic images the radiologists have interpreted, and that they can therefore be held liable for negligently misinterpreting those images, is a long-established and clear-cut legal dictum.2 What is not so clear-cut, however, is whether a radiologist has created a doctor-patient relationship and therefore owes a legal duty to a patient who has undergone a radiologic examination in the radiologist’s facility but whose images the radiologist has never seen. This issue is important, for if no valid doctor-patient relationship exists between the radiologist and the patient, the radiologist cannot be held liable even if the radiologist has acted negligently. In a case described previously (Grossman v Los Alamitos Medical Center, California, 1993), a jury found that a doctor-patient relationship existed between an on-duty hospital-based radiologist and a patient who had undergone chest radiography in the radiology department, even though the radiologist had no knowledge that the study had been obtained. An emergency medicine physician had ordered chest radiographs on himself without first registering with the radiology department. The physician interpreted the radiographs without consulting the on-duty radiologist, missing what was then a small tumor. The radiographs were filed away and never officially interpreted until 17 months later, when follow-up radiographs revealed a substantially larger tumor that eventually proved fatal. In the ensuing legal action, a jury found that the radiologist had a legal duty to interpret all studies performed while the radiologist was on duty, effectively creating a doctor-patient relationship with anyone who was imaged at the department during the time of his assignment, and awarded the plaintiff $2.9 million. Although the case involved conventional radiographs, there is no reason to doubt that the jury’s findings would have extended to electronic images as well. In an Arizona case, an appeals court also ruled that an on-duty physician had established a doctor-patient relationship with a patient whom the physician had not seen personally (Hiser v Randolph, 1980). A specialist in internal medicine was paid by the hospital to be available to provide care to all patients arriving at the hospital’s emergency department. One night a woman in diabetic coma was brought to the department. The nurse telephoned the on-call physician, but the physician refused to go to the hospital, instead telling the nurse to refer the patient to another physician. Treatment was delayed and the patient died. The internist was sued by the patient’s family for not responding to the emergency department nurse’s call. The appeals court acknowledged that, as a general rule, a physician is free to contract for his or her services as he or she sees fit and can refuse to treat a patient, even under emergency conditions. But in this particular case, stated the court, the defendant physician had agreed in advance to assume care of all patients who came into the emergency department, thereby establishing a doctor-patient relationship with all such patients. At first glance, these cases dealing with physicians who refused to go to a hospital to treat patients might appear distinguishable from the case of a radiologist who failed to interpret a lost PACS case. However, applicability to the radiology setting can be appreciated if the rulings are considered in broad terms (i.e., that of on-duty physicians failing to provide a medical service when they are made aware, or should be made aware, of the patient’s existence). 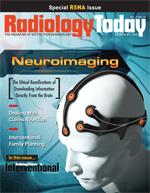 In such context, a radiologist who agrees to be on duty in a radiology department agrees to interpret every radiologic study obtained during a given period, thereby creating valid doctor-patient relationships with all patients undergoing radiologic studies. The covering radiologist would then have a duty to interpret in a timely fashion all studies obtained. Patient data contained within a radiology information system could easily be construed as constituting notice to the radiologist that the patient’s examination requires attention. Under this scenario, the radiologist’s failure to apprise himself or herself of a radiologic examination that must be interpreted promptly may well be considered negligent conduct. The second major legal issue to be addressed is whether liability can be imposed on a radiologist merely by the fact that PACS images are lost. Patients whose conventional radiographs are lost can seek damages under state laws requiring retention of radiographic images.3 These laws, which vary in detail from state to state, typically require health care institutions to retain radiographic images and other medical records for a specified number of years after a patient’s undergoing diagnostic testing or treatment. Although we are not aware of any states that yet require retention of PACS images, the legal distinction between digital and hard-copy images has not been defined. In fact, any distinction between these two types of images may eventually disappear altogether. Already, in its standards for teleradiology and for digital image data management, the American College of Radiology points out that federal and state medical record and radiographic retention requirements should be adhered to for both teleradiology and digital images. Furthermore, according to the ACR, because digital images are generally acceptable for record archiving and storage unless otherwise specified by state or federal law4, it seems unlikely that courts would treat digital images differently from radiographs. How the judiciary deals with the issue of lost radiographs is illustrated in an Illinois case in which a young woman suffered a fatal sigmoid colon volvulus after a cesarean delivery. At trial, it was discovered that abdominal radiographs obtained before the patient’s death had disappeared, and as a result, the family of the deceased patient lost its malpractice case against the radiologist who had been accused of misinterpreting the radiographs. Claiming that it would have won the case against the radiologist had the radiographs not been lost, the family sued the hospital for violating the Illinois statute covering retention of medical records and radiographs. After its determination that a patient injured by loss of radiographic images could sue the custodian of the radiographs, the court emphasized that the loss of the images in itself was not sufficient to prevail in a lawsuit. Actual injury or damages directly resulting from the loss of images would have to be demonstrated. The Illinois Supreme Court decision centered on a lawsuit filed against a hospital, not a radiologist, and concerned images that were lost after their official interpretation, not before. Whether individual radiologists can be held to the same duty as hospitals to preserve radiographs is unclear. In a later decision, the Illinois Supreme Court held that the state’s x-ray retention act applies only to hospitals, not to physicians (Miller v Gupta, 1996). Nonetheless, the court ruled that physicians have a duty to preserve evidence and thus could be sued under negligence law for destruction or loss of evidence. “Vicarious liability,” the legal term that describes the inputting, or placing, of the negligence of one person on another, has been discussed previously.5 In the setting of contemporary hospital radiology departments, the term usually applies to the liability relationships between radiologists and technologists, nurses, or other department personnel. The rationale for this legal concept is that persons who order someone else to do something are acting as if they themselves are doing it. Courts generally reason that employers who assign specific duties to employees will obtain financial benefit from these employees, and thus the employers should be responsible for any harm caused as a result of these actions. Another legal concept known as the “borrowed servant” principle holds that, in a hospital radiology department setting, when department personnel are assigned temporarily to attending radiologists who have the right to control and supervise them, those personnel are borrowed servants of those radiologists. As a result, the radiologists may be liable for any acts of alleged negligence committed by those personnel even though the personnel may be employed and paid by a health care facility.6 Chairpersons of a radiology department may be subject to an even greater degree of vicarious liability, because some courts have held chairpersons liable for failing to develop or implement department policies designed to ensure good patient care, or failing to supervise department personnel.7 Given this broad applicability, it is reasonable to assume that laws about retention of medical records and radiologic images could be successfully brought to bear against radiologists under whose watches PACS images are lost. To our knowledge, no appeals court has yet addressed the issue of whether radiologic images that have yet to be interpreted qualify as evidence to the same extent as do images that have been interpreted. However, there is little reason to believe that the law would draw a distinction between images lost before, and those lost after, interpretation. PACS and departments that do not use film are relatively new developments in radiology and have yet to be explicitly explored in depth by the courts. However, a considerable body of existing law addressing injury resulting from lost or misplaced radiologic images indicates the strong possibility that liability will be imposed on radiologists should PACS images be lost or misplaced and patient injury result. Risk management in radiology can lessen the likelihood of incurring a medical malpractice lawsuit, maximize the chance for a successful defense if such a suit is filed, and at the same time enhance the quality of patient care. The following risk management pointers will help radiologists meet all of these objectives when faced with potential liability arising from lost PACS images. • Radiologists using PACS in all or part of their practice should develop and implement quality control mechanisms to ensure that all examinations performed are successfully transmitted to the PACS network and interpreted in a timely fashion. Because this may be difficult for an individual radiologist to accomplish in a busy radiology department, dedicated personnel or an effective automated system may be required. • A formal mechanism should be created to identify and address all uninterpreted PACS examinations and a formal policy established for all radiologists to follow in promptly interpreting them. • In situations in which an entire study or key images are lost, or when images cannot otherwise be interpreted, the referring physician or the patient should be promptly contacted to schedule a repeated study. — “PACS and the Loss of Examination Records” appeared in its original form in the American Journal of Roentgenology. It is reprinted here with permission of the American Roentgen Ray Society. 1. Brenner RJ, Westenberg L. Film management and custody: current and future medicolegal issues. Am J Roentgenol. 1996;167(6):1371-1375. 2. Berlin L. The importance of patient registration and processing. Am J Roentgenol. 1997;169(6):1483-1486. 3. Berlin L. Storage and release of radiographs. Am J Roentgenol. 1997;168(4):895-897. 4. American College of Radiology. Digest of Council Actions 1990-1999. Sec II, Professional and Public Policy Statements. Reston, Va.: American College of Radiology; 2000:114-115. 5. Berlin L. Vicarious liability. Am J Roentgenol. 1997;169(3):621-624. 6. Berlin L. Liability of radiologists when supervising technologists. Am J Roentgenol. 1999;172(2):285-289. 7. Berlin L. Liability of chairpersons when administrating radiology departments. Am J Roentgenol. 2000;175(4):967-972. 8. Berlin L. Alteration of medical records. Am J Roentgenol. 1997;168(6):1405-1408.